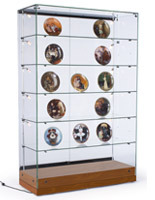 This Display Cabinet Keeps Valuable Items in View! Six 5-watt LED lights illuminate products from above! Built-In-Wheels make it easy to move the case for rearrangement or cleaning! Ten shelves offer multiple display options! 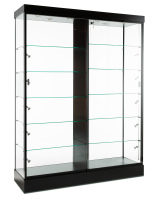 These glass cabinets, retail display cabinets are crafted from tempered glass to extend a longstanding, rugged and secure alternative to traditional glass cabinets. A sliding, locking door assures only authorized retail associates have entrance to the cases. 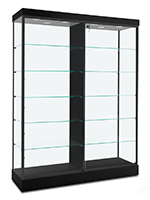 These retail display cabinets are set on wheels so it is easy to uproot the display cabinets to maintain or rearrange your store. These large retail display cabinets incorporate a center support panel; on each side of this panel are five adjustable shelves to suit products of deviating heights. These retail display cabinets also incorporate six 5-watt LED top lights controlled by an electrical cord and switch. 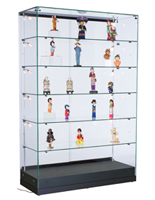 These retail display cabinets are a ideal fit for retail stores, museums, school or business lobbies, universities, jewelry stores, gift shops and many additional! 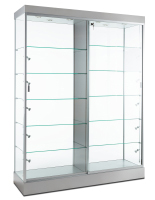 The retail display cabinets, likewise recognized as glass cabinets, are extra wide to suit large product lines. 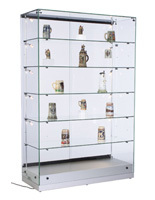 These retail display cabinets are ideal for retail stores with bounded floor area. Tower-style retail cases capitalize on vertical area. while counter style showcases take up a lot more of these sales floor, without supplemental display location. 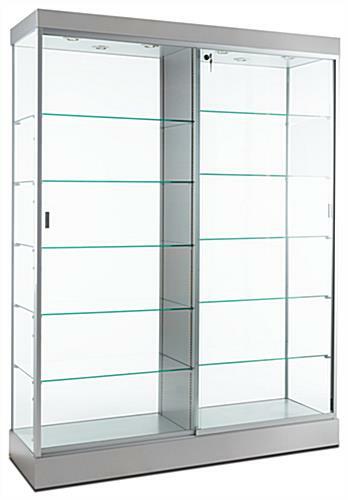 These retail display cabinets incorporate a silver finish and appearance outstanding filled with jewelry, glass vases or figurines, electronics, fine china, sports memorabilia and more. Please add 20 business day(s) when determining the lead time.